John Maher Racing » How much power to drive the cooling fan? How much power to drive the cooling fan? 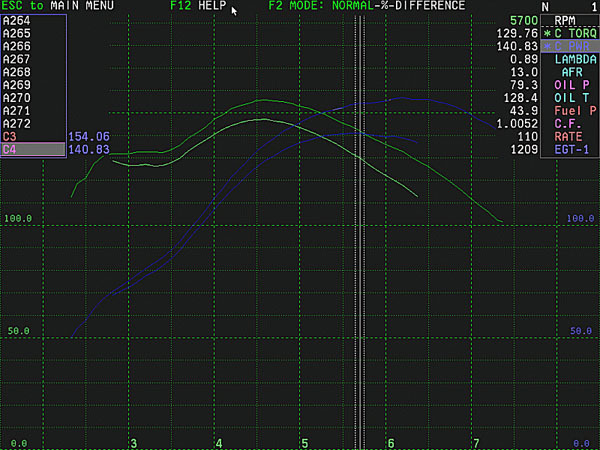 A graph of back to back belt-on, belt-off dyno tests. 2110cc bus engine, fitted with late model stock fan and standard diameter crankshaft pulley. The blue lines depict horsepower. As rpm increases, power taken to drive the fan increases exponentially. At 3000rpm, the fan takes less than 4bhp. At 5700rpm (cursor location) the power difference is a little over 13bhp. At 6000rpm it’s up to 18bhp. It’s possible there may have been some belt slip at higher rpm levels, in which case the power differential would be greater than shown. I ran several repeat no-change tests to hopefully eliminate that as a possibility. Of course the belt could have been slipping to some degree but unless it was by the the same amount at the same rpm each time, the repeat tests told me otherwise. The engine was fitted with a 75amp alternator, which consumes around 1.5bhp. It would be a little less for the 55amp version. I’ve run similar tests on subsequent engines and have found the power differential very similar across the rpm range i.e. as you would expect, power taken to drive the fan is consistent, regardless of engine capacity or power output (using same fan and pulley combination).